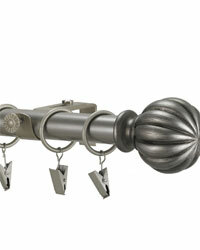 Window treatment curtain rod sets make creating the look you want in your home easy. 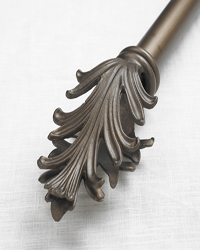 Choose from a wide selection of curtain rod types that include decorative styles that feature looks for a modern homes décor to the traditional minded. These affordably priced rod sets include choices in wood and metal, including sets with a wrought iron look. 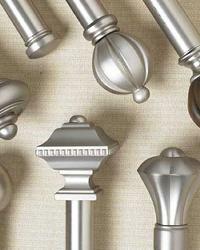 A range of color choices are available in all of these curtain rods sets which include finials and brackets as well as hanging hardware. Optional double brackets and curtain rod rings are also available. K Scope presents these adjustable curtain rod sets that include finials, adjustable curtain rod and curtain brackets that are able to fit any sized window treatment. 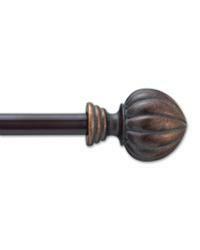 These authentic wrought iron curtain rods are custom made to your exact specifications. These wrought iron traverse rods and hardware accessories include everything you need to complete your window treatments with style. Single and double traverse rods are baton drawn and can be center, left or right draw. 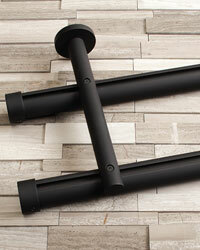 Four beautiful colors include matte black, rustica (dark brown), pewter and oil rubbed bronze.